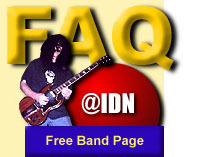 How can I get a Free Band Web Page at IDN? What style of music do you accept? How much does it cost for the Free Band Web Page? Can I add in my own soundclips? Can I add my tourdates to your database? Simple, fill out the New Artist Registration Form You can fill out all of your band information and your IDN Band Web Page is automatically created. All genres, all styles. We accept everything from death thrash metal to country to children's music to jazz to industrial. If you call it music, we accept it. Free! Which is why we call it the Free Band Web Page. The IDN is a free organization for independent artists and bands. Can I add in my own soundclips to my Band Page? Yes, that's not a problem. Just fill out the form and we'll automatically link to your MP3s or other sound files. Yes, of course. It's up to you to keep all dates updated. Yes, no profanity. We have a children's music education section and we sell children's music so young children will be surfing this website.